One of the first things I wrote for publication (back in the late ‘60s), it’s a short story for boys. The editor rejected it for “implied profanity”. I looked down at the corner of my bulletin sticking out from the pages of the hymnal. 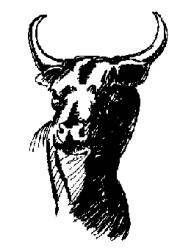 Without thinking about it I sketched a snorting bull in the margin of the bulletin. This emblem silently protested what the preacher was saying. Bull! It just didn’t make sense. Actually that pastor is ok. But this morning I disagreed with his main point, but what could I do? In church you just have to sit there and take whatever he dishes out and you don’t have a chance to say anything about it. My way of getting around this is to doodle in the margin of the church bulletin. I don’t sit with my parents so I can get away with it. Pastor was saying that since we are Christians we should not let sin have any more dominion over us – whatever that means. It doesn’t make sense to me. I wish he’d stick to telling Bible stories and stay away from this abstract stuff. After service my dad asked what I thought of the sermon and I said, “OK, I guess”. No sense saying what I really thought and causing some big hassle. Dad thinks this preacher is great. Monday after school old Mrs. Morgan called. She’s this old lady who lives down the road from us. She rents out a couple of houses and I earn a few bucks doing odd jobs for her. She wanted me to move a chicken coop. No sweat. And she pays good. I trotted on down. “It’s over on the next block, Harry,” she said. “It’s only a small cage and I want it moved over to my backyard. Put it behind the garage. It’s behind that yellow house – third one from the corner. You go on over; I’ll be over there after while”. So off I went not even suspecting all the hustle that was coming. When I got to the yellow house, I strolled around back but I didn’t see anything that looked like a chicken coop. The only thing there was a dog house, a rickety tool shed and a couple of angle-iron poles sticking up in the ground with some chicken wire stretched between them, piece of plywood propped on top for a roof. Nothing to it. But I supposed that was the coop Mrs. Morgan wanted moved. I started to rummage around in the tool shed looking for something to pull up the posts with when I heard this woman yell, “Sic ‘em, King”! This big ‘ol dirty white dog came tearing out of the house just about taking the screen door off the hinges barking his fool head off and snapping at my feet. Boy did I jump. I’m talking an Olympic 9.8 standing broad jump. In no time at all here I am on top of that tool shed with that brute yapping and snapping and jumping all around trying to bite me. A fat woman busted out of the house, soap suds up to her elbows. Waving a dishtowel and yelling at me. “What you doing in my yard! I’m calling the cops! Sic ‘em, King!” she shrieked. I tried to tell her that Mrs. Morgan had sent me over but that dog was making too much racket for her to hear even if she’d wanted to hear. Right about then here comes Mrs. Morgan around the corner of the house and then the fuss really started. Between those two yelling women and that yapping dog, I was caught right in the middle. The fat woman kept yelling, “This here’s my property! You two git off my land! Both of you – Sioc ‘em King! I’m callin’ the Sheriff. You sold this place to me. Ain’t nothing here is yours no more. I’m owner now and you ain’t got no right to nothing here. I’m callin’ the Law”. That dog kept growling and barking and jumping against the side of the shed snapping at my feet. The roof of that old shed began to creak. Every time the dog hit it, it gave a little more. I got two steps running start and jumped. Managed to clear the back chain link fence except that my pants leg caught on the top of the wire and I tumbled over on my face. One of the neighbors must have heard the ruckus and called the sheriff’s office because about then a cop car with two deputies came squealing up. The women were going at it tooth and claw now and that dog was running in circles around them barking it’s head off. One deputy took the dog and the fat woman inside; the other one took Mrs. Morgan off to the side of the house to hear her side of the story. That one came over to the fence and asked me what was going on and I told him that I didn’t know what the hell it was all about. They made Mrs. Morgan leave. Turns out that she used to own the place but a couple of months back she sold it to the fat lady and her husband. Since she’d sold the place, she was no longer the owner; she has no right to anything there – even an old chicken coop. Once there’s a new owner, then the old owner has no right to anything on the property. I got to thinking about that and remembered what the preacher said Sunday. It struck me that since I’m bought with a price and Jesus is my new owner, then sin has no right to the property at all – not even to an old chicken coop. Maybe what the preacher said isn’t such bull after all. Sin has no more dominion over me, but just the same when the old owner comes around wanting to stake a claim, there’s a heck of a row! And a lot of times I feel like I’m stuck on top of the tool shed in the middle or a fuss going on inside me. I wish the preacher would talk about that sometimes.